It seems that the loss of traction control is having a lot more effect than predicted by anyone. Practice/qualifying was a wild assortment of tail-happy slides and slips for everyone; the cars are obviously more difficult to drive and more entertaining for the viewer as a result. I would chalk one up for the FIA were it not for the fact that the fans have been calling for this for years. Hamilton's pole-setting lap was a model of precision and efficiency, however, in contrast to Kubica's on-the-limit charge. As everyone is saying, without that slight off at turn 12 (the Pole still keeping his foot down with incredible bravery), we could have had a BMW in grid spot number one. The big question remains: are the Beemers on a par with the big two at last? Remembering that this is just the first race and that BMW seem to be good at this track anyway, I have to say that I think the Swiss/German team are indeed in the frame for the season. People are talking of sandbagging through testing but that ignores the way BMW function - they have worked through their problems methodically, improving the car step by step, they have not gone for flashy light tank runs to grab ephemeral headlines, preferring to get the car right for races. I would say that Ferrari and McLaren should be worried. Even Dr Mario Theissen was a little surprised at how quickly the car has shot to the front, as though he expected this a little later in the season, not now. There is still vast scope for improvement in the F1.08, its bold innovations just beginning to pay off. Expectation is now that Kubica is the man to watch, naturally enough in view of his hugely entertaining laps in qualifying, but I would suggest caution on this one. Last year the policy was to allow Robert a run at the leaders on low fuel while Quick Nick put in the solid and respectable times of a man on more sensible fuel quotas; the likelihood is that the team has stuck by this strategy. That would make Heidfeld's fifth spot very ominous for the leaders. We already know that he races better than he qualifies and a late first pit stop will give him a good chance of a podium finish. There is just one fly in BMW's ointment - Lewis Hamilton. Love him or loathe him, he is the business, a driver so excellent that he can produce the goods to order. His pole-setting lap was a masterpiece of confident, unflustered driving, so exact and neat that it seemed inevitable he would be fastest. Kovalainen is close in terms of sheer speed but Hamilton leaves us thinking he could have gone faster if necessary - as, indeed, he said afterwards. And so to poor Kimi, bumped down the grid by a sick Ferrari and a lurking detail in the rulebook. Would he have grabbed pole had he been given the chance? I think it unlikely. The painful fact for Ferrari fans is that the team's expected advantage has evaporated and the drivers will have to work to stay with the leaders. Kimi may have been able to set a better time than did Massa but not by much, I think. It all adds up to a spicy recipe for the race, however. Raikkonen, Webber and Glock will be fighting through the field to negate their qualifying misfortunes, Hamilton and Kubica will be arguing at the front, in the opening laps at least, and we can expect some great battles for the points positions. Oh, and I should say something about Vettel. All right, the lad did amazingly well, for the first time showing the outstanding talent everyone talks about. I can grumpily say "about time too" but would remind you that I have only ever asked for some proof of his ability; okay, now I have it. More, please. My take was the same with LH. He is all work in the car. Very professional driving. As we were watching the view from above the cockpit, LH did not fight the car much, he just drove it smoothly for the most part. I wish there was a way to see that camera view for an entire lap for all the top drivers of yesterday. Especially from the onboard of Massa. I would like to see if he was fighting the car. The BMW's during testing did just that. They were testing all aspects of a race. Different tire compounds with different fuel levels. The German/Swiss were obtaining valueable data that they did use in Albert Park yesterday. I was surprised with Kubitsa though I honestly thought Heidfeld would be the quickest of the pair. Either way I am very happy with BMW. But they still have work to catch LH. The McLaren is very close to perfection it seems with the way he drove yesterday. I heard alot of talk about the ECU. I am not sure if the speed commentators were siding with the other teams against the McLaren/Microsoft device or not. The issue was raised and spoken about a number of times. It would not surprise me if some teams are using the device as an excuse. One excuse I heard was that the teams did not have enough time to properly interface with the new device as apposed to their own device of last year (Renault). I fear we will hear alot of this if LH wins and Alonso finished far behind. We'll hear a lot of excuses from Alonso this year - the car is not up to it and that's that. The overhead shots show just how good LH is - very little movement in comparison to other drivers and he controls slides effortlessly. The one who fights the car is Kubica - his fast lap was pure passion and guts. It's an interesting contrast in styles but traditionally the smooth guy wins. What a gas it was to watch car control in action! Hamilton and Kubica have been battling each other since their days in karting, with Robert exploiting some of Lewis's weaknesses, so I'm quited stoked to watch them challenge each other all year. There is no question now that BMW have stepped up a level, but it's really too early to tell where their natural place on the ladder is. As Damon Hill pointed out, Albert Park produces strange results that don't necessarily reflect what the rest of the season will look like. And you can't forget about Kimi. It's not just the cars. As good as Kubica is, he probably isn't a Kimi/Lewis beater, at least not yet. But he seems to be in the right team at the right time. All true, Arnet - a fascinating season in prospect. But I still think that Heidfeld is the real danger to the big boys. He has the talent, craft and guile to surprise them. I still thought LH was not as smooth as Nick or Nico for that matter. The car, as always is, far ahead of the competition, with the Scarlets hitting a wrong note. Fuel pressure problems? Come on.. not to Ferrari. Anyways, I, as millions of others, am happy with the return of passionate racing to F1. I couldn't believe how good that McLaren looked from the onboard camera. Even when the rear stepped out it looked smooth. Lewis clearly has it exactly to his liking. I think the difference between Lewis in the McLaren and the onboard we saw in practise of Sutil's FIF1 was stunning. The FIF1 looked evil and Sutil was using 6 or 7 steering inputs every corner. I want to see Massa and Kimi onboards to see the difference. I think traction control will be less relevant/obvious when we get to a proper race track. Melbourne is a very green track and tends to stay green to some extent all weekend. It is a shame Monaco is not the first race of the season as it would show who had a car under them and who was just hanging on to it. Kubica made a comment in the post quali press conference that the BMW is more stable under braking without the brake assist than it was with it. He thinks they went the wrong way with it last year and it was causing problems. It begs the question why didn't the drivers notice and didn't BMW ever do baseline testing with it switched off. It might have been interesting to see a shot from Fisichella's point of view to compare with Sutil's car. Somehow I doubt that Giancarlo had to work that hard. Agreed that we need to see the Ferrari onboards to see the difference to the McLaren but I'd like to see how Nick managed in comparison to Kubica. It may be that the BMW boys only noticed the difference under braking once the TC had gone - it might never have occurred to them that it was part of the braking problem. So, presumably, BMW didn't try the car without TC until they had to. i'm thinking the fun this season may be in watching the battle between the bmw boys. hamilton is amazing and honestly, i'm starting to wonder who kimi could have been in a previous life to deserve the thrashing he gets from luck, fate, whatever. no comments on bourdais? i'd have been surprised if he had done any better. champ car champ holds a lot less champagne these last few years than it did when either zanardi or montoya defected. I wasn't attempting a complete coverage of qualifying, Vera, and concentrated on the BMW situation since that is where my main hope lies this season. As it turned out, I'm glad I didn't talk about Bourdais in this one, since he did a whole lot better in the race. Could he be one of those guys who races much better than he qualifies? 1. The BMW is obviously a very fast car, do you think anyone will try to mimic there design? It seems almost impossible to copy. I agree with you about Hiedfeld, perfect demeanor for a champion. 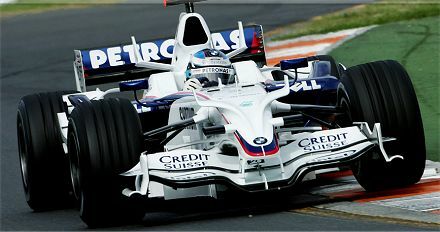 Kimi went to Mclaren and his career flourished, Heidfeld has the same talent but he is just now getting the car. Luckily, BMW is the one car that can dramatically improve over night. 3. Great race, my biggest surprise was how Alonso managed 4th. He seemed to really be racing at the limit the entire race, that may have been the car though. You said a bundle, Dan! The BMW looks the most complex car on the grid aerodynamically and I think, for that very reason, other teams will only copy aspects of it warily and after much testing in wind tunnels. A similar thing happened with Ferrari's wheel inserts - it took a while for other teams to explore the possibilities and come out with their version. In fact, it's a trend that BMW still haven't copied! You are right about the potential for development in the BMW too. Because they have been bold enough to go for some radical innovations, they have a lot if ideas that are in the early stages and can be honed to improvement quite quickly. Other teams, progressing along better known routes are reaching the end of development possibilities for many of their ideas and performance gains are small as a result. The downside is, of course, that BMW risk taking a wrong direction that could throw their season into disarray. But they're Germans and so tackle everything methodically, one at a time. There is much less likelihood of becoming confused that way. I said before the season that Bourdais would probably blow young Vettel into the weeds after a while. That looks impossible now but it's a long season with plenty of time for Bourdais to get the hang of it. We shall see. As for Alonso - that was Alonso and nothing to do with the car (which is a dog). The man can drive, it's a plain, unarguable fact.